Winter produce can turn out the most flavorful salads. This one happens to be one of my favorites. 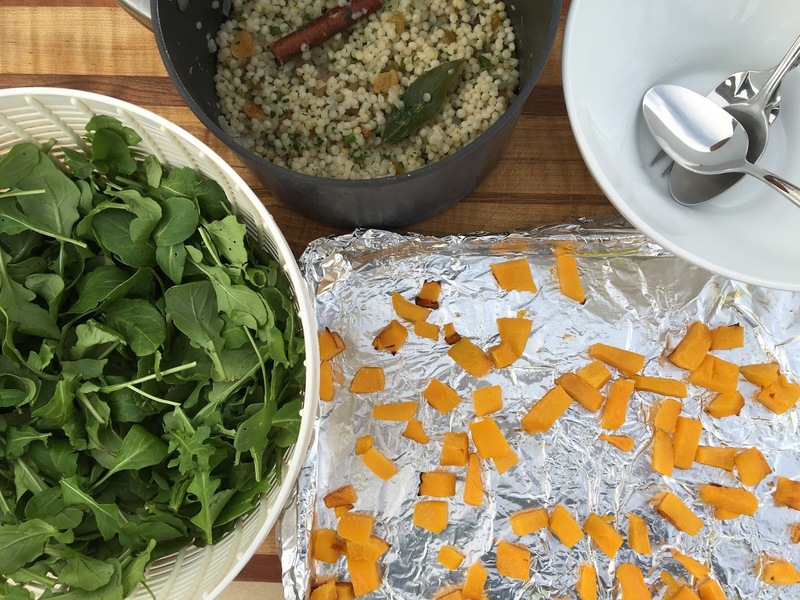 You can’t go wrong with roasted butternut squash that’s been paired with pearl couscous and nestled on a bed of fresh peppery arugula. The greens are lightly tossed with a lemon vinaigrette that helps brighten up the flavors. Serve as a side salad or as a main dish, works great either way. Many winter vegetables taste best when roasted. Butternut squash is no exception. When roasting place veggies in a single layer and drizzle with just a tiny bit of olive oil, also do not crowd them on the baking sheet. This way you get the caramelization and browning that is desired for the most flavor. 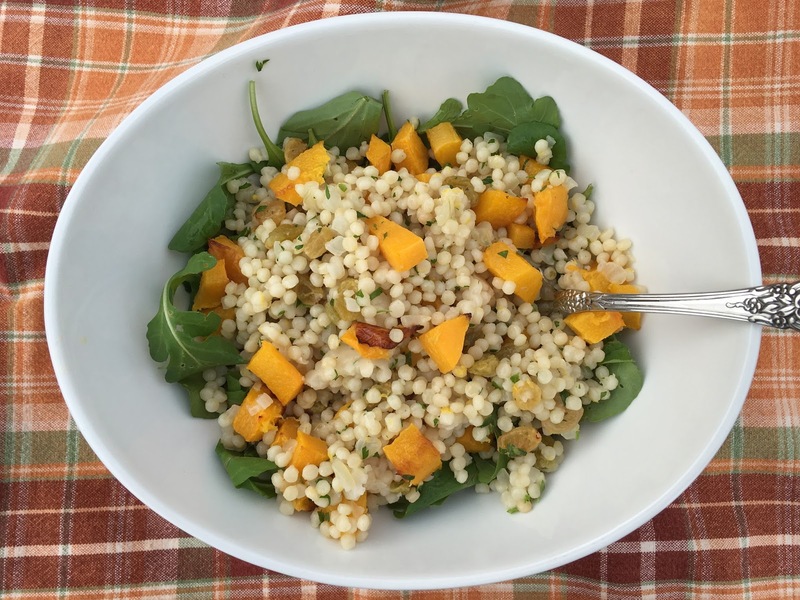 You could substitute farro, barley or even quinoa for the couscous with delicious results. Enjoy! Peel then cut butternut squash into small pieces, (see picture below) drizzle with olive oil and salt, roast about 20 to 25 minutes, until tender. Set aside. In a medium sized saucepan on medium heat, melt the butter. Add shallots and sauté until translucent, about 5 minutes. Add couscous, bay leaf and cinnamon stick. Stir mixture until couscous is lightly browned. Add salt and broth, bring to a boil. Reduce heat, cover and simmer until liquid is absorbed, about 10 minutes. Remove from heat and stir in butternut squash, parsley, pine nuts, lemon zest and raisins. Place arugula in serving bowl, drizzle with vinaigrette and lightly toss greens. Add couscous mixture on top and serve with the rest of the vinaigrette on the side. This event is being hosted by Sue Slusser Lau of A Palatable Pastime Thank you, Sue!! Roasted Brussels Sprouts and Wild Rice Salad plus more Winter Salad Recipes #SundaySupper from Sunday Supper Movement Join the #SundaySupper conversation on twitter on Sunday! We tweet throughout the day and share recipes from all over the world. Our weekly chat starts at 7:00 pm ET. Follow the #SundaySupper hashtag and remember to include it in your tweets to join in the chat. To get more great Sunday Supper Recipes, visit our website or check out our Pinterest board. Would you like to join the Sunday Supper Movement? Your welcome Dena, I've been eating butternut squash like there is no tomorrow. Take care! Thanks Deanna, this was my first time participating, had fun. After reading all these salads with butternut squash, I'm going to have to pick some up ASAP! And I adore Israeli couscous, too---what a marveous pairing!! Thanks Liz, you are so sweet, I adore them both too! Looks wonderful! I bet the arugula and golden raisins really make this special! What a beautiful salad; the butternut squash grabbed my attention immediately! I must try this! Nice to 'meet' you! Thanks Roz, nice to meet you too!!! This looks amazing! The flavors in this salad would surly win me over I'm sure. Thanks Tammi, so nice to meet you! Thanks Louise, you are so thoughtful, appreciate it! Thanks Tandy, have a great week! Hi Kim, are you planning on posting next week? will check and see. I am jealous that you still have butternut squash at this time of year. The salad looks satisfying and very delicious, Cheri. Thanks Angie, I know we are pretty lucky here in the desert this time of year. This is my kind of salad! I am loving roasted butternut squash on almost everything at the moment. It's so good in tacos too! Thanks Dannii, will have to try it in tacos, sounds delicious! I found a very old looking spoon? i love pearl couscous--the other stuff is just too tiny! great dish, cheri! Thanks Grace, you are so sweet! Yay!!! I love your recipe- butternut squash is definitely not just for fall. Great idea to include the Israeli couscous! And aloha from Hawaii!! It's been a really nice trip here - perfect weather for fun activities. 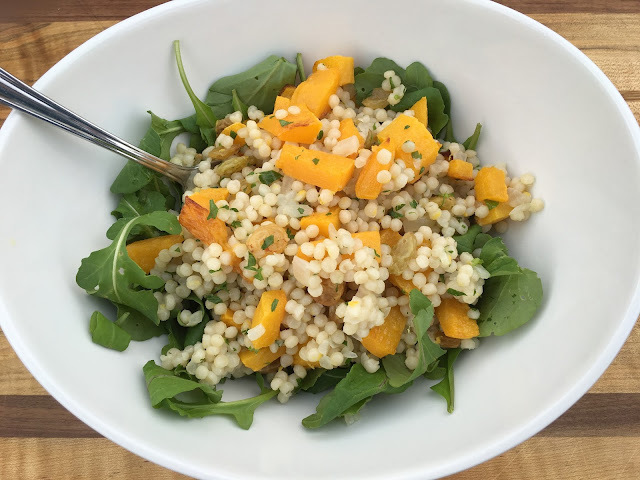 Thanks Susan, Israeli couscous is one of my favorite ingredients to use in salad like this. Hi Susan, it must be so beautiful there, I bet you are having a wonderful time. Such a lovely winter salad. Millet is a great swap for couscous too. Thanks Laura, will have to try millet, I bet that would be delicious! I can't get enough of roasted butternut squash around this time of year!The parsley and couscous sound perfect in here! Thanks Kelly, I know me neither. Take care! This looks delicious! I seriously need to try making couscous sometime. Thanks Cathleen, hope you have a chance to try this sometime. Now this is my kind of salad. I can just tell from your ingredient list that I am going to love it. Great round up of winter salads too! Thanks Bam, having fun cooking along with the Sunday Supper group. I love everything you have in here! Cant wait to try this salad. Thanks Monica, hope you have a chance. Arugula is such a perfect green for this tasty salad! I roast veggies almost every day and sometimes our dinner consists of a big pan of roasted potatoes, shrooms, onions, garlic and carrots and we're happy, lol. Great dish, Cheri! Thanks Robyn, I do the same thing, in fact thats what we had last night for dinner. These are all my favorites in one bowl Cheri - what a brilliant combination! I can't get enough Butternut squash :) Have a lovely week! Thanks Tricia, I love butternut squash too, one of my winter favorites. I can make a meal of roasted squash, now I can mix it with other flavors. Great salad. Thanks Wendy, appreciate you stopping by. I think you know all my favorite ingredients! This sounds great! This looks so good to me, Cheri! I love cous cous and butternut squash and arugula. The dressing would just take it over the top. Thanks for sharing your recipe! Thanks Shari, appreciate you stopping by. I love the subtle cinnamon flavor in the couscous - what a great pairing with all the other ingredients! Thanks Lynne, so nice to meet you! I think this kind of salad makes a great lunch! Thanks Sue, appreciate you stopping by.